Born in Port Arthur, Texas in 1925, Robert Rauschenberg’s art is characterized by an irreverent and innovative approach to images, mediums, and disciplines. While stationed with the U.S. Navy at Camp Pendleton, San Diego, Rauschenberg was inspired to become a professional artist by his first museum visit to the Huntington Library in San Marino. Following his honorable discharge from the Navy in 1945 and with funding from the G.I. bill, Rauschenberg pursued his art education at the Kansas City Art Institute, the Académie Julian, Paris, and the Art Students League, New York. Beginning in 1948, Rauschenberg enrolled at Black Mountain College in North Carolina, initiating his lifelong collaborations with composer John Cage and choreographer and dancer Merce Cunningham. 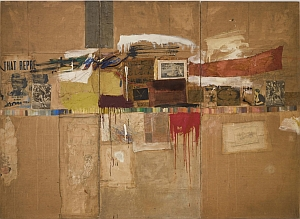 In 1951, during the artist’s first solo-exhibition at the Betty Parsons Gallery in New York, Rauschenberg’s work was selected by art dealer and World War II veteran Leo Castelli and artist Jack Tworkov for inclusion in Today’s Self-Styled School of New York, also known as the Ninth Street Show. Held at the Ninth Street Gallery, New York, this group exhibition would consolidate the movement that came to be known as the New York School. Beginning in the mid-1950s, Rauschenberg’s Combines revealed his desire to transcend established artistic categories. By bringing the images and objects of everyday life into the arena of abstract painting, he blurred distinctions between painting and sculpture. The iconoclastic spirit of the Combines would become a distinguishing feature of his work. Throughout his more than sixty–year career, Rauschenberg remained committed to artistic experimentation and collaboration with performers, printmakers, engineers, writers, artists, and artisans from around the world. Winner of numerous prestigious accolades for his groundbreaking work, including the International Grand Prize in Painting at the Venice Biennale in 1964, Rauschenberg is among the most celebrated artists of his generation. Image: Rebus, 1955 Combine: oil, synthetic polymer paint, pencil, crayon, pastel, cut-and-pasted printed and painted papers, including a drawing by Cy Twombly, and fabric on canvas mounted and stapled to fabric. Three panels: 96 x 131 1/8 x 1 ¾ inches (243.8 x 333.1 x 4.4 cm) overall. The Museum of Modern Art, New York. Partial and promised gift of Jo Carole and Ronald S. Lauder and purchase. ©Robert Rauschenberg Foundation/Licensed by VAGA, New York, NY.